The climate in the Hawaiian Islands is influenced by the predominant trade winds, which are blowing from the northeast about 90% of the time in the summer months (May to September) and about 50% of the time in the winter months (October to April). As moisture-laden clouds approach the Hawaii Islands from the northeast, they get stuck on the islands’ mountains, where the moisture comes down as rain. Lanai island lies in the lee (or rain shadow) of the West Maui Mountains on neighboring Maui (which rise to an elevation of 5,788 feet / 1,764 m). Therefore, most of the rain clouds that these trade winds bring with them come down on Maui and don't reach Lanai. Lanai is an arid island. Its highest peak, Lana'ihale (rising 3,370 feet / 1,030 m) receives most of the island's rainfall, about 30-40 inches (760-1,015 mm) per year. The rest of the island receives only about 10-20 inches (250-500 mm) per year. Lanai's only town, Lanai City (population 3,102 as of 2010), is located near the center of the island at an elevation of 1,644 feet (501 m). 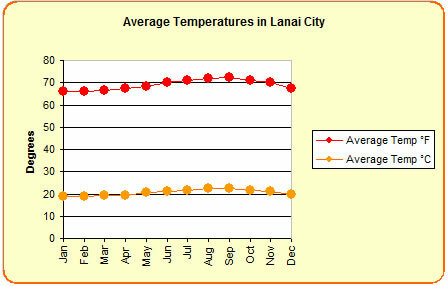 The temperature is therefore a bit cooler and the air a bit less humid in Lanai City than at sea level. In the winter months, it can get chilly in Lanai City at night. Visitors to Lanai have accommodation options either in Lanai City or on the island's south shore at Hulopo'e Bay. Staying at the oceanfront resort has a more tropical feel (with the ocean breeze, warm air and palm trees), while staying in Lanai City offers more of a mountain environment, with the scent of Norfolk pines in the often times crisp air. Lanai's average ocean temperature is around 75°F (24°C) in February and 82°F (28°C) in September. Vog (volcanic smog) is much more common on the Big Island of Hawaii than on Lanai since the Big Island is the only Hawaiian island that still has active volcanoes. Occasionally when the winds are blowing from the south (known as Kona winds), the vog from the Big Island's volcanoes affects the air quality of the other Hawaiian islands, including Lanai. On those days you will notice a haze in the air, especially when looking into the distance. While most people can tolerate vog and won't notice any difference in how they are feeling, for those with asthma or other breathing problems vog is much more of an issue and it is best be avoided by staying indoors.